This entry was posted in English and tagged Genesis, Old Testament. Bookmark the permalink. These are great visuals Mark! I just found your site when I saw the Reliabilty of the New Testament visual shared on Facebook. You are a blessing! I love this Genesis page! Hi Mark, I am trying to get some great graphic to teach bible lessons for young children (5,6 and 7 years old) about God’s creation. I love this graphic, I think it will help them. Do you have slightly larger version that I can bring as 8.5×11 size? Thanks! The visuals at this site are excellent! I was only looking for a chart on Kings of Israel/Judah, but was delightfully surprised to find your gold mine here 😀 I was just teaching on understanding Genesis 1-2 a few weeks back, and your visual here would have been great if I had found it a little earlier. So crisp and clear! One suggestion though, I think you are under-valuing the 7th day. It kind of looks like a minor addendum at the end, when I think it is much more climactic. Cf how it is picked up in Hebrews 3-4. Trying to think of suggestions of theologians to read, but maybe William Dumbrell’s stuff might be a starting point with someone you are familiar with (although perhaps you already are very familiar!) Anyhow, thanks again for making all these visuals available online! Thanks for the encouragement, Craig. I guess the main focus of the diagram was to explain how God creates the universe, i.e. how he ‘forms’ and ‘fills’ it, rather than capturing everything about Genesis 1-2. In that sense, rather than valuing the first six days over the seventh, it shows visually that God rests on the seventh day because he doesn’t create anything on it. Does that make sense? Would I be able to use this Graphic with my year 8 SRE classes? Hi Caroline. It’s great to hear from you. Yes, by all means, use the diagram with your class. I’m glad it’s helpful! 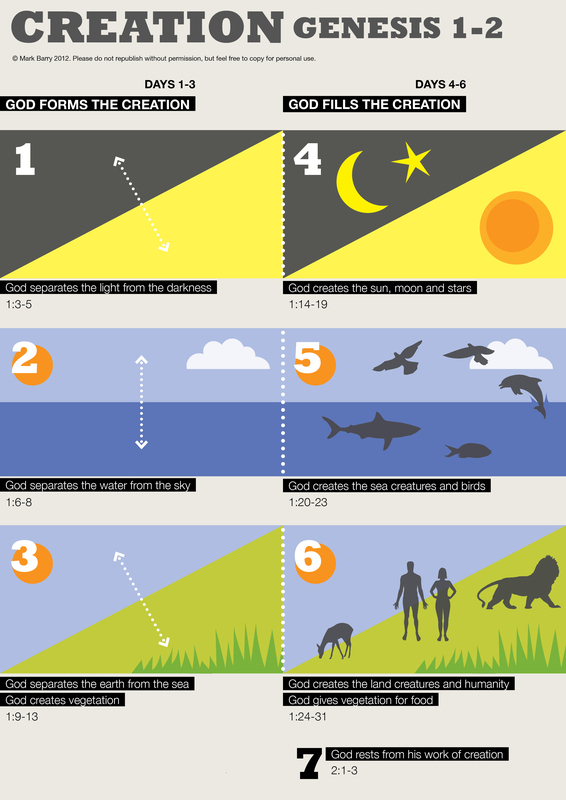 I’m writing a sermon on Genesis 1 this afternoon and noticed on this graphic that day two says “God separates the water from the sky”. I know this sounds really nit picky but shouldn’t the phrase be something more like “God separates the waters below from the waters above”? After all, it’s the sky that God uses to do this separation. Just a thought. Also, is it okay if I print out copies of the graphic to hand out to the kids at church? I Love your Creation Chart! When I teach children creation I try to explain how what He created own Day one He filled on Day four and so on, and your chart shows it visually just perfectly. I Love the added idea of separation and arrows to further add parallels to the day and how organized and purposeful our Lord is! I hope its okay for me to copy it and put it in my Bible.